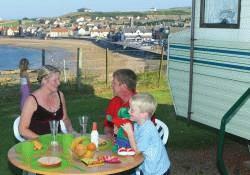 Come to the Scottish Borders for caravan parks in Berwick on Tweed and campsites throughout the Borders. A trout farm near Selkirk camping, with drinking hostelries in Galashiels nearby golf courses in Peebles, or for horse riding near Stobo castle Scotish camp sites and Scottish caravan site horse riding in the region. Visit castles stay in cottages to let, eat out Melrose or Lauder. IMPORTANT FACILITIES ON CAMPING SITES VARY A GREAT DEAL - Some of these have extensive recreational facilities on site - These include Games Room - Gym - Snooker/Pool - Organised Entertainment - Bar - Cafe - Restaurant - Leisure Centre - Swimming - Cycle Hire - TV Room - Internet Access - Disabled Access - Laundry - Children's Play areas - Take Away Food - Dogs mostly welcomed if kept on a short lead and supervised. 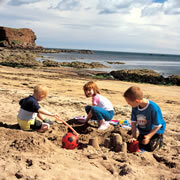 A beautiful 4 Star Park situated on the Berwickshire coastline. There is something for everyone including commanding views and the park is near the towns sport and leisure complex, 18 hole golf course and busy working harbour in the picturesque coastal village of Eyemouth. Enjoy the variety of entertainment on offer in the Park's Driftwood Bar, including Dylan the Dinosaur, Children's Entertainment. Everything you will need for a great holiday is within walking distance. You may bring your pet to Eyemouth Holiday Park in Tourers or when you purchase your own Holiday Home, but we do not accept pets in our Caravans For Rent. Coastal and Countryside Walks in Conservation Area, outdoor play area, scuba diving, launderette, indoor pool nearby, pool table, entertainment, conservation area, supermarket nearby, nearest village 500 metres & caravan sales. From the North or South, Leave the A1 towards Eyemouth on the A1107. On entering the Town, the park is signposted. Turn right at the Shell petrol station and left at the bottom of the hill into Fort Road. Within the historical parkland of the Thirlstane Castle near the river. Around 45 minutes by car, south of Edinburgh just off the main A68. Once in Lauder the Castle cannot be missed! 5 minutes walk to good shops, hotels etc. in the village. Situated in the picturesque Borders village of Coldingham, Scoutscroft Holiday Centre is within a few minutes walk from the safe sandy beach of Coldingham Bay. 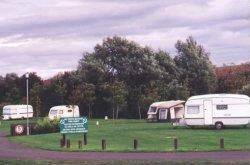 Our new Mallard Park opened in 1995 for tourers, motor homes and tents. Electricity, water and drainage on hard standings provide Mallard Park with the only Super Pitches in the Area. New Laundrette facilities, Amusement Arcade, Children's Entertainment programme. New Centrally Heated Luxury toilet and shower block with a family room which includes a bath for infants. Scuba Diving Centre with dive shop; equipment hire and air available. Coldingham village with small pubs, grocery shop and one garage, and Coldingham Priory are situated nearby. Also nearby is the scenic fishing village of St Abbs, and Coldingham Loch, one of the most famous fishing lochs in Scotland. The nearest large town is Berwick, and Edinburgh is only 44 miles away. Coldingham is on the juction of the A1107 and B6438 Reston to St Abbs Road.